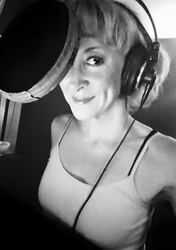 Jessica began working in the dubbing industry with ADVfilms (now Sentai Filmworks and Seraphim Digital) back in 1995, with her first show being 3 BIG LINES in an anime no one has ever heard of called Evangelion. She went on to record maaaaaaany titles with ADVfilms, as well as Central Park Media, 4Kids, Right Stuf, International (and many more) including: Excel Saga, V1-3 (Excel Excel), Ruin Explorers (Fam), Dragonhalf (Mink), New Kimagure Orange Road: Summer's Beginning (Hicaru), Those Who Hunt Elves, S1 (Celcia), Dirty Pair, OAV 1-5 (Yuri), DNA² (Karin Aoi), Magical DoReMi (Drona), Kare Kano (Tsukino), Comic Party (Eimi), Queensblade (Nanael), Pokemon (Kay the Raichu Trainer), Virus Buster Serge (Donna), Slayers: the Motion Picture (Meliroon), Boogie Pop Phantom (Moto and Poom Poom), and New Cutey Honey (The Lovely Warrior, Honey Kisaragi), in which she was personally cast by Go Nagai for the English dub. Some of her more recent work includes: Nadeshiko (Street Fighter V), Hange Zoe (Attack on Titan and Attack on Titan Junior High), Gatchaman Crowds (Hajime), Brynhildr in the Darkness (Kotori Takatori), The World God Only Knows Goddesses (Haqua), Fairy Tail the Movie: Phoenix Priestess (Éclair), Infinite Stratos II (Tatenashi), Dog and Scissors (Natsuno), Problem Children are Coming from Another World, Aren't They? (Black Rabbit), Rozen Maiden Zurücksplen (Suigintou), Girls und Panzer (Saori), Maria Holic/Maria Holic Alive (Kanako), Ikki Tousen series (Ekitoku Chouhi), and Rip Van Winkle in Team Four Star's Hellsing Ultimate Abridged Episode 4 and Ifalna in Final Fantasy VII: Machinabridged (FF7:MA) - Ep. 8 to name a couple!